Police arrested a man Friday following an argument over a set of car keys. Huntingburg Police were called to the report of a 28 year old man with lacerations to the neck at an apartment at 224 North Geiger Street in Huntingburg. Police arrived on scene and secured the area for EMS to treat the victim. The victim, Abdirizaq Yusuf Muuse, told officers that he and 34 year old Moustafa Hasan Adam had gotten into a verbal argument over a set of car keys. Moustafa allegedly then pulled out a knife and tried to stab the victim and steal his car keys. Upon further investigation, officers located the keys and knife used in the attack inside of Moustafa’s apartment. 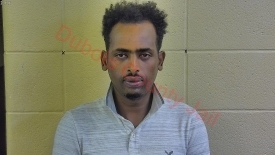 Moustafa Hasan Adam of Huntingburg was taken to and booked into the Dubois County Security Center on a level 3 felony charge of Robbery and a level 5 felony charge of Battery. The victim was treated and released from Memorial Hospital and Healthcare Center in Jasper. Be the first to comment on "MAN ARRESTED AFTER ARGUMENT OVER CAR KEYS"